Exactly as described and what I was looking for. Looks great in my kitchen. The color and texture is great to look at. 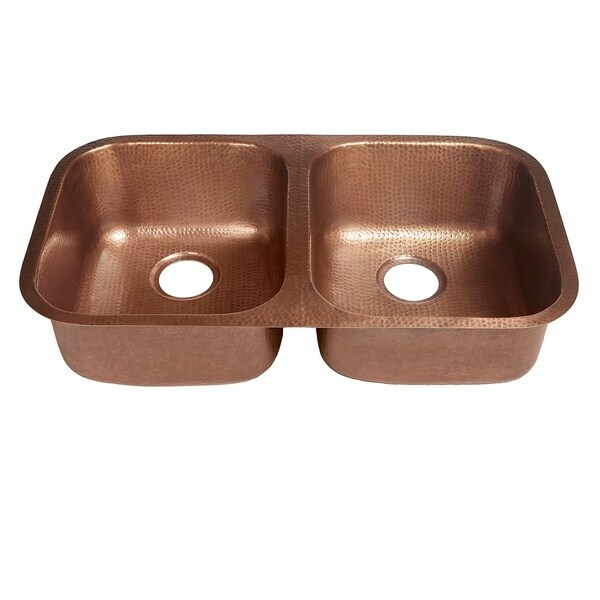 The Kandinsky double bowl undermount kitchen sink is artfully handcrafted from 16 gauge pure solid copper. The undermount design makes it a natural fit with nearly any countertop. With hassle-free installation and effortless care, a copper sink from Sinkology is designed to fit your lifestyle and be a focal point of pride for your home. This true work of art comes with a limited lifetime warranty. Outer Dimensions: 32.25" x 18.5" x 8"
Inner Dimensions: 16.5" x 14.5" x 8"
Dimensions 36.0 In. X 23.0 In. X 10.0 In. The sink is beautiful! I have had a copper kitchen sink in the past and appreciate the fact that copper kills bacteria on its surface. This one has a beautiful patina, and is heavy! Copper ages beautifully and does better with a hammered surface like this, so that the indentations hold the darker color! I had my granite installer also install this sink. It looks great! We really enjoy the copper look - we previously had a stainless steel sink. My husband installed himself with no real issues. I love the color and look it gives my kitchen, it does patina really quickly - i personally like the look where there is a very light patina; for my personal taste so i do need to try and polish it very 2-3 days to maintain the color we like. This sink is amazing! We are doing a copper kitchen and didn't have room for the farmhouse. Next best thing! So unhappy with this sink. The picture doesn’t look like the actual sink. The sink is dull with little to no shine, the color is more brown then copper, the hammered look on this is weird and I wish I would have never bought this sink. nice quality however I had no idea the high maintenance on this copper sink! "Can this sink be installed as a drop in sink?" "How difficult is it to keep clean and does it stain easily?" "We are replacing our kitchen sink and the opening is 30" X 18". Will this sink fit?" The minimum cabinet size is 31 inches. "We will have well water. In your opinion, do you think this sink could stand up it? I don't mind some wear and tear because we are doing a rustic kitchen anyways. Just wondering." I also have well water and it is holding up very well. I love this sink! "I would like to buy this sink but as I'm in the UK i need to know if its compatible with standard waste pipe connectors. Would you please tell advise? What size waste pipe connects to the sink; The diameter of the plug hole; Does it come with clips for fixing; Is there a template for a cutout included; Are there additional charges to be paid in the UK? Many thanks for answering this Overstock!" "Is the sink comparable with UK sizing? Would you please tell us the size of the waster required & diameter of the required plug? Are there any other charges payable this end on delivery other than quoted on final payment to yourself? Does it come with clips for fixing - we would like to fix to a wooden kitchen counter? Also is there a template included for cutting out the whole? Many thanks Anna"
"Is it hard to maintain it's beauty? Can I leave dirty dishes in it without ruining the finish?" Hello Browneyedsue. It is not hard to maintain the beauty of this copper sink. The patina that produces the color of the sink is a self-healing living finish and it only requires warm water, a soft towel, and soft dish soap to clean it. We recommend wiping out the sink after use to take up any standing water left in the sink. It’s best to leave dirty dishes because the patina will be discolored or stripped away by pockets of standing water and any acids, such as tomato cause or ketchup, but any damage to the finish will be repaired on it’s own by the self-healing patina. Please let us know if you have any further questions.